It's been very cold lately and the temperature continues to fluctuate between cold and bone-chilling cold. It's this type of weather that makes me crave hot and hearty soups. آبگوشت بزباش - Abgousht bozbash is one of those soups that will warm you up and lift your spirit - especially if you grew up eating abgousht/abgoosht in Iran. 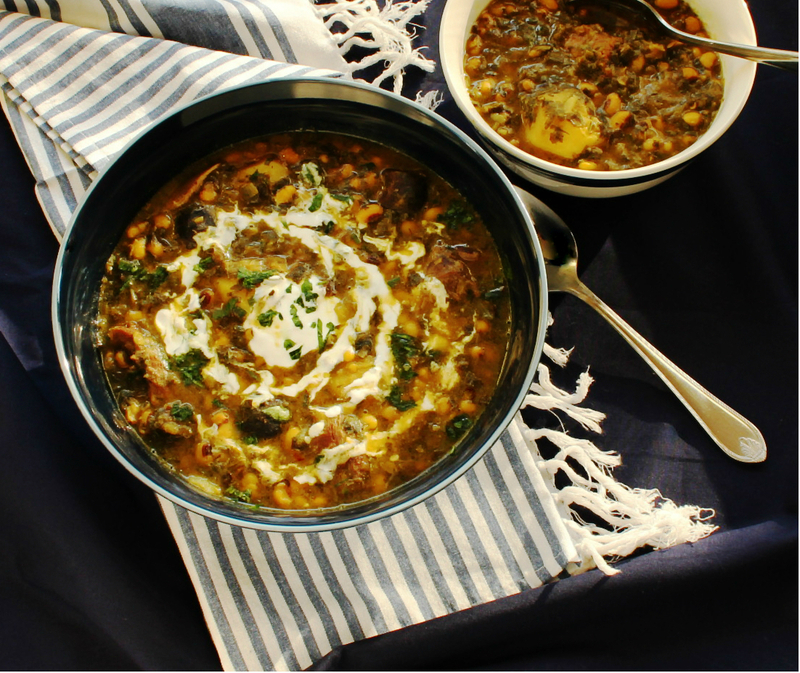 Bozbash is a cross between a dizi/abgoosht (lamb soup) and ghormeh sabzi (lamb stew with herbs). This abgousht is made with a generous handful of parsley and chives and some fenugreek. It's as if a culinary genius had decided some ages ago to turn ghormeh sabzi into a soup and serve it without any rice or had decided to make a more flavorful refreshing abgoosht with plenty of vegetables! 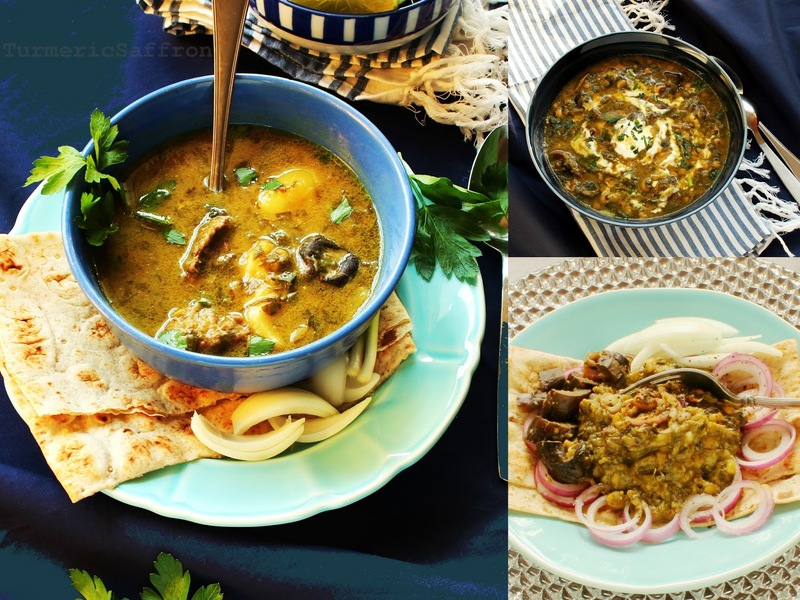 The combination of these two classic and popular dishes works well and makes this a tasty and aromatic rich soup. Like many other recipes the ingredients may vary from region to region. According to my sister-in-law in Tehran, bozbash is made with red beans while on the other hand a friend of mine from Isfahan makes it with white beans. Knowing that bozbash is also made with black-eyed peas, I chose to use the latter. I wanted bozbash to be it's own dish and not so much like one or the other, an offspring with its own identity! Also, loobia cheshm-boboli (black-eyed peas) are the prettiest beans with the cutest Persian name out there! چشم- cheshm means the eyes, بلبل-bolbol means nightingale and لوبیا- loobia means beans. Therefore, لوبیا چشم بلبلی- loobia chesm-bolboli translates to "nightingale-eyes beans." To Persian poets bolbol - nightingale is a bird that sings to its beloved flower, the rose. 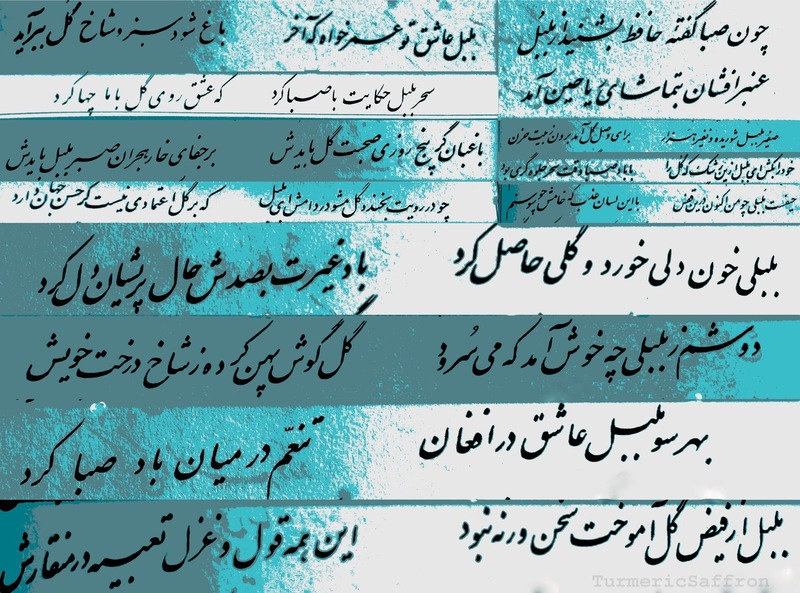 A collection of some of Hafez's poems about bolbol. It's important to remember that Persian cooking is about taking your time, cooking most dishes low and slow to achieve the best taste and enjoy sharing it with others. Savor these moments in the kitchen cooking or baking for yourself or your family rather than focusing on how time-consuming or labor-intensive cooking is! A note about the herbs used in this soup: use fresh parsley and chives if possible. I used dried fenugreek since I didn't have any fresh fenugreek at home and I used chives instead of the Iranian tareh which I cannot find here. You can also use scallions/ leeks (green parts only). To serve abgousht-e bozbash you can either serve the soup with all the meat, beans and potatoes or strain the soup using a colander or scoop out what you want for your گوشت کوبیده - goosht koobideh - mashed meat using a large slotted spoon. You can serve the broth with some beans, meat, and potato and mash the strained ingredients and serve on the side. In a large soup pot place the shanks, add 8 cups of water, bring to a boil over medium-high heat. Skim foam as they come to the surface. Add the turmeric, onions, beans, dried limes, cinnamon, salt and pepper. Cover and cook on medium heat for an hour. Add the herbs and potatoes. Add a little water if needed. Cover and continue cooking for another 30-40 minutes or until the meat is fully cooked. Taste and adjust the seasoning. Remove the pot from the heat. Drain the soup through a large sieve. Remove the bones and mash the ingredients that are left in the sieve using a masher. Ladle the broth into a servings bowl and put the گوشت کوبیده - mashed meat onto a platter. 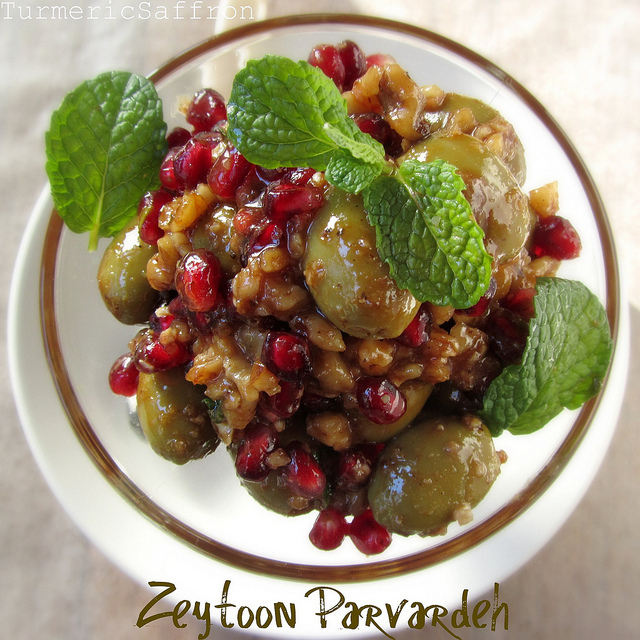 Serve hot with warm bread, sabzi khordan and torshi.